Concern with the amount of maintenance down-time and the environment impacts, SEP set out to look for a better solution. We saw a Hitachi screw compressor on demonstration in a tradeshow. It was surprisingly silent with minimal vibrations. We tested the compressor by placing a standing coin on the machine, and the coin stayed up throughout the demonstration. Impressed by the demonstration, SEP bought their first set of Hitachi Air Compressor (an OSPA 22) at the exhibition and has since been using Hitachi Air Compressors in all their Singapore and Batam plants. "SEP is focus on saving energy as well as reducing the impact on the environment. After installing Hitachi Compressor, we noticed that, besides being a lot quieter, the compressor room is now a lot cooler " said Mr. Koh. 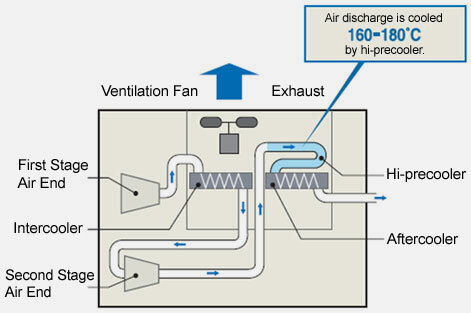 Hitachi air compressors come with a patented Hi-precooler system which cools high temperature discharge air to 180°C. With less heat being emitted, less air-conditioning is required to keep the room cool. Patented Hi-precooler system which cools high temperature discharge air to 180°C and below before entering the aftercooler. This keeps the aftercooler below the upper temperature limit. Hitachi Industrial Equipment Systems Oil Free Screw Compressor Catalog 2011. 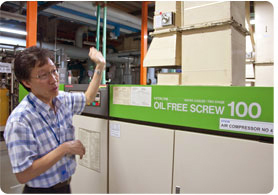 "SEP is very conscious with maintenance," said Mr. Koh, citing why he chooses to use Hitachi Air compressors in all their Singapore and Batam plants. He recalls the days when he had to roll up his sleeves and be on stand-by to service the old air compressors. Before we switched to Hitachi screw compressors, we had to have a trained team inhouse to maintain the machines. In contrast, maintenance with Hitachi screw compressors is a breeze. Maintenance nowadays is simply a change of the oil separator. In addition, with longer overhaul period, maintenance cost and down-time are reduced significantly. Owing to SEP’s rigorous maintenance routine and the low maintenance requirements of Hitachi Air Compressors, relevant work processes almost never had a down time. "Most of our requests are attended to within 24 hours, whether it is quotation requests or after-sales servicing," said Mr Koh. Mr Andrew Cheah of Hitachi Asia Ltd, Industrial Components Division (ICE) was in charge of the account for the last 5 years. He makes it a point to know SEP's business and requirements well, so he can respond within the day. "We go the extra mile for each customer, even if the request may involve some areas outside our scope. Our aim is to provide a one-stop solution for our customers". Hitachi Asia Ltd, Industrial Components & Equipment Division provides products, services and solutions to enhance our customers' energy efficiency, productivity and operations. Our diverse and innovative products range from air compressor, ink jet printer, inverter, programmable logic controllers, hoist, electric motor, vortex blower, switches and circuit breaker. Our market coverage includes Singapore, Malaysia, Indonesia, Philippines, Thailand & Vietnam (South East Asia), India, Pakistan, Bangladesh, Sri Lanka & Nepal (South West Asia) and UAE, Saudi Arabia, Qatar, Kuwait, Oman, Egypt, Jordan, Syria, Lebanon & Bahrain (Middle East Countries). A technical Training Center was created to provide value add to our customers and it is a unique product and solution demonstration area where customers can personally discover how Hitachi will be able to assist them in making the right decision to enhance their operation's efficiency and provide total solution to their requirements. In addition, the training center can be used for product training for our master dealers on our products. ICE will continue to innovate, diversify to provide total solution in our infrastructure industry. For more information on ICE's products and solutions, please visit Hitachi Industrial Equipment Systems website.